Running and maintaining a business requires content and data. this is displayed through paper and digital data. Ensuring data confidentiality is paramount to business success. Shredding or destroying your documents is one method of data destruction. Shredding documents does improve data security. A simple office shredder shreds paper but this can be reconstructed. Industrial paper shredding specialists are available to handle all your data destruction needs. Reputable document destruction companies operate within data protection laws and the Data Protection Commissioner (DPC.) A reputable paper destruction will shred all your documents to a level beyond reconstruction. A Din 66399 Standard is used by shredding companies and ensure a high level of quality shredding. At Security in Shredding we are experts in the Data Destruction Industry and we are happy to explain the new DIN 66399 shredding standard to our clients as their knowledge on it and the benefits from it is limited. The modern DIN 66399 replaces the DIN 32757 and for the first time divides data destruction into three separate protection classes and seven security levels in total. Any and all paper data can be shredded and destroy your documents confidentially and securely with our specialised trucks. Our On site Shredding is available for scheduled services or on call service. We regularly operate throughout Ireland and in Limerick and Galway regions. We provide lockable bins and our trained staff will handle these bins from your premises to the truck. The secure receptacle is automatically lifted by our mobile shredding technology and is constantly under surveillance and watched through our on-board monitor. 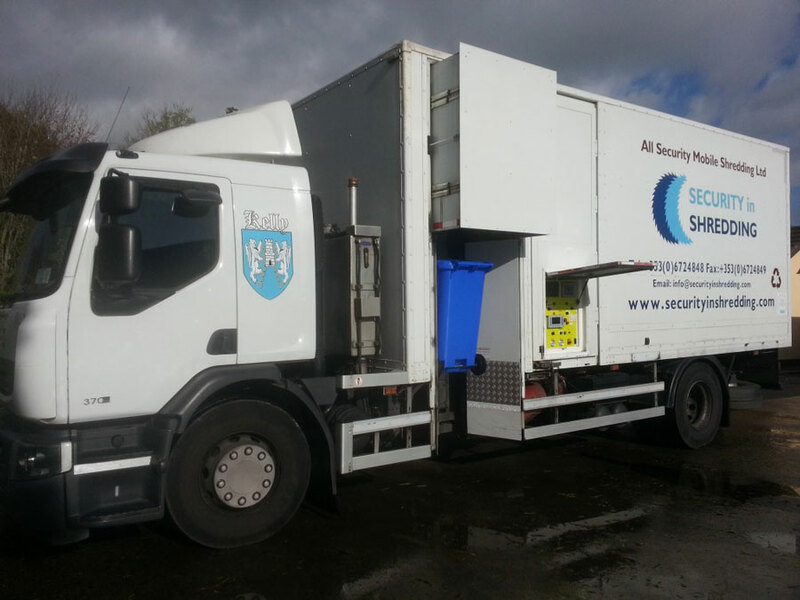 Our mobile shredding unit destroys the client’s material on site at their premises. Our specialised trucks can handle 1 X 240 Litre receptacle per minute. This will require minimal amount of time to shred your documents providing an efficient and excellent service. The service is also environmentally friendly. Clients will ask us what can be shredded? there are a number of documents and document types that can be easily shredded by us. “Lever arch files,” “older files,” and or “archive files” are often asked if they can be shredded. They can be shredded. We have a list of recommended documents to shred, view our what to shred list of recommended documents to destroy. This entry was posted in Confidential Shredding, Data Destruction, Onsite Shredding and tagged Confidential Shredding, Data Protection, Data Protection Commissioner, Data Security, document shredding, document shredding limerick, Onsite Shredding, shredding Galway, shredding Limerick by Security in Shredding. Bookmark the permalink.